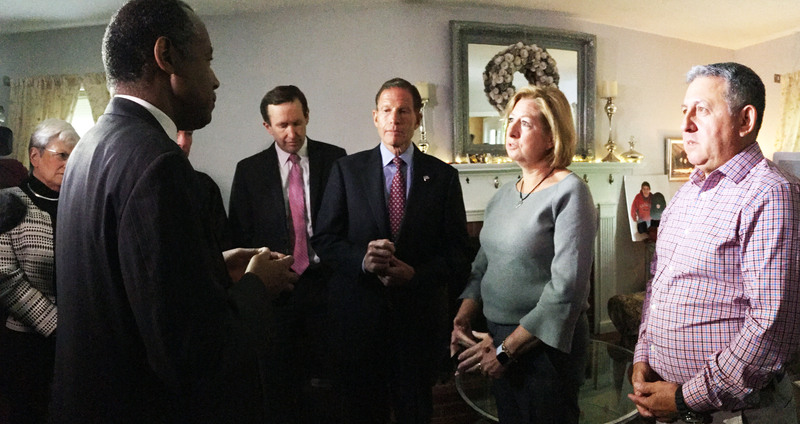 In a visit earlier this year, U.S. Housing Secretary Ben Carson, left, listens to Willington residents Maggie and Vincent Perracchio explain about their crumbling foundation while Connecticut Sens. Richard Blumenthal and Chris Murphy, U.S. Rep. Joe Courtney, D-2nd District, and Lt. Gov. Nancy Wyman were also there. Washington – As Congress rushes to finish work before its August recess, Connecticut lawmakers are trying to get some federal help for homeowners who have been victimized by tainted concrete that has caused the foundations of their homes to crumble. On Wednesday, Sens. Richard Blumenthal and Chris Murphy introduced several measures they hope to attach to a bill that would fund the Department of Housing and Urban Development, or HUD. The legislation aims to help homeowners in about three dozen towns in north-central and northeastern Connecticut that have foundations built with concrete containing pyrrhotite from a quarry in Willington. Pyrrhotite is a mineral that expands with moisture and causes foundations to bow and crack. One amendment would provide $100 million over five years from HUD to states like Connecticut that have created non-profit crumbling foundation assistance funds to repair damage to residential structures due to pyrrhotite. A second amendment would direct the U.S. Geological Survey to create a nationwide map showing where pyrrhotite can be found, while a third would direct the U.S. Treasury Secretary to assess the financial impact of the crumbling foundations and outline regulatory and legislative actions to help mitigate that impact. 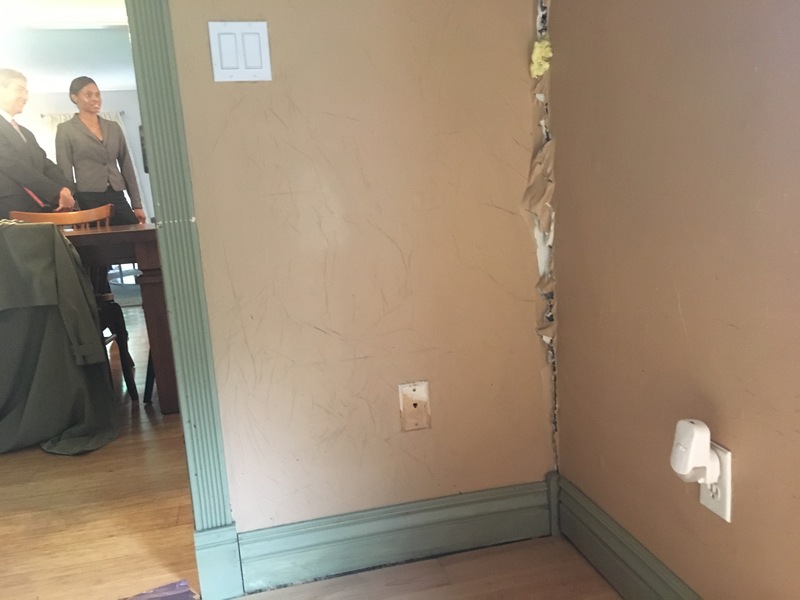 Last year, the Connecticut General Assembly established a Crumbling Foundations Assistance Fund to allow $100 million in bonding over the next five years to assist victimized homeowners. Blumenthal said it’s now the federal government’s turn to help. The shifting foundation of the Perrachio’s home in Willington is causing upstairs walls to separate. While the senators’ legislation has not yet had a vote in the Senate, progress was made last week on similar legislation in the U.S. House. Reps. John Larson, D-1st District, and Joe Courtney, D-2nd District, won House approval last week for measures that would direct the U.S. Geological Survey to create a nationwide pyrrhotite map and direct the Treasury Department to assess the financial impact of the crumbling foundations on banks, homeowners and towns that have seen property tax revenues erode because of depreciated values of pyrrhotite-tainted homes. The amendments were included in a spending bill that would fund the Interior Department and several other agencies next year.